The Motorola Moto E5 is another midrange smartphone from Motorola. This device comes with Android 8.0 Oreo out of the box, 2GB RAM, 4G LTE compatibility and 4000mAh battery. I think Motorola saw the potential of the midrange market and are taking advantage of it. The company doesn’t want to slow down one bit, as they keep releasing their midrange phones. We have to give it to Motorola though, their midrange phones has the average specs for light users. Without further ado, lets have a look at this affordable beauty. Looks like the average midrange smartphone from Motorola, it looks portable and comfortable to hold. The curved sides from the back fits perfectly on your palm, it sports curved edges as well. Its aluminum body is sleek and smooth, weighing less than the average midrange smartphone. The single rear camera and LED Flash sits pretty on a circle at the top middle in a horizontal format. While the Motorola logo is underneath in style, it supports dual nano sim as well. The design on the Moto E5 is pretty basic and there’s no wow factor to it. It seems Motorola doesn’t feel like going bezel-less with their midrange E series just yet. But at least there’s no physical home button on the E5 and the fingerprint sensor was moved to the back. Although going with the design, there’s no fingerprint sensor spotted anywhere at the back. Nevertheless, the fingerprint sensor could double with the Motorola logo at the back. Now lets go back to the screen, the 5.7-inch IPS LCD capacitive touchscreen is compact. With bezels practically everywhere, it has a resolution of 720 x 1440 pixels. A 16:9 aspect ratio and 294 pixel per inch density, the visuals won’t be that bad. Protecting the screen is a Corning Gorilla Glass 3 and an oleophobic coating offering scratch resistance. Motorola Moto E5 comes loaded with Android 8.0 Oreo operating system. So you get to enjoy the Oreo experience first hand with the Moto E5 without updating anything. Running the device is a Qualcomm Snapdragon 425 chipset and Quad-core processor clocking at 1.4GHz. For everything graphics, the Qualcomm Adreno 308 processing unit is fully in charge. Multitask through apps with 2GB RAM space which is okay for light users. For storage, there’s a standard 32GB internal storage space, although a 16GB cheaper variant might be released as well. Both Moto E5 versions are upgradeable upto 128GB using the microSD slot. There’s a 13MP rear camera on the Motorola Moto E5 with f/2.0 aperture that takes 3K resolution images. It boasts of features like autofocus, LED flash, geo-tagging, panorama, HDR and host of others. 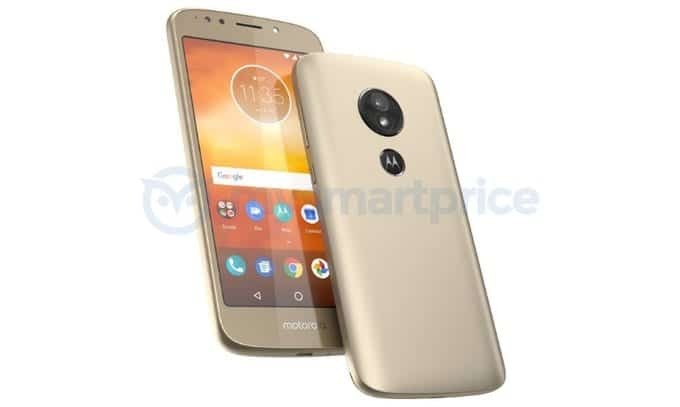 There were rumours the Moto E5 sports dual selfie camera, but that’s not the case here. There’s a single 5MP front shooter with f/2.0 aperture and Flash for taking selfies in dark places. Motorola Moto E5 boasts of a 4000mAh Li-Ion battery that is Non-removable. It comes with fast charging feature that helps boost the battery from 0% to 100% in 1.4 hours. What is Motorola Moto E5 Price and Availability Status? You can click on the links below to view the latest Motorola Moto E5 price & availability.